While I'm Waiting...: 5 back-to-school prayers for moms! 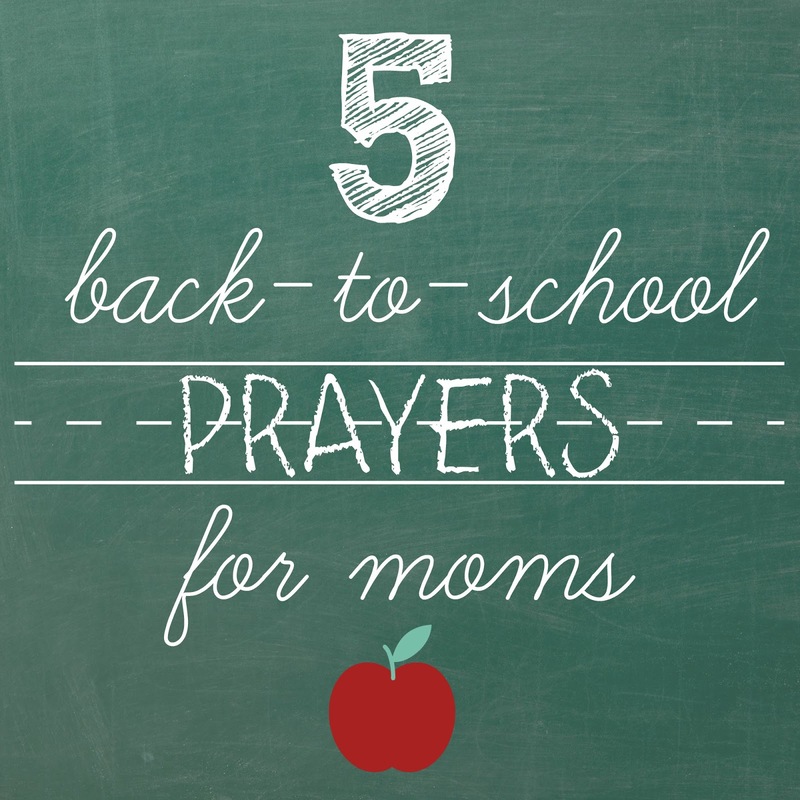 5 back-to-school prayers for moms! It's so hard to admit without tearing up a little (or a lot!) but our kiddos head back to school on Monday. It's truly my least favorite day of the year! I'm not sure what makes it so hard. Maybe I'm just not good with change and the start of a school year brings about all kinds of changes. And to add to my anxiety level, this year our oldest will head off to high school! How in the heck did that happen?! I swear it feels like he was just in Kindergarten! And, it isn't so much the thought of having a high school student, it's the realization that we only have four, count them FOUR more years to teach him everything we want/need him to know. That's a little daunting! Thankfully our middlest will continue at the school she attended last year and will enjoy everything that comes with being the oldest on campus. Meanwhile, the baby will start Kindergarten. Cue all the tears. Heck, I even cried at Meet the Teacher! I don't even want to think about the mess that I will be come Monday morning. But, with all the excitement, new opportunities, and changes comes LOTS of extra time for prayer. 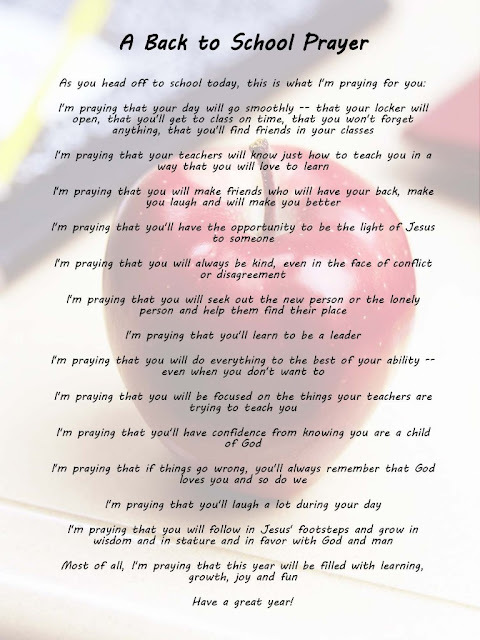 Today I'm sharing a few prayers that I came across that are perfect for the first day of school, the second day of school, and every day after that! 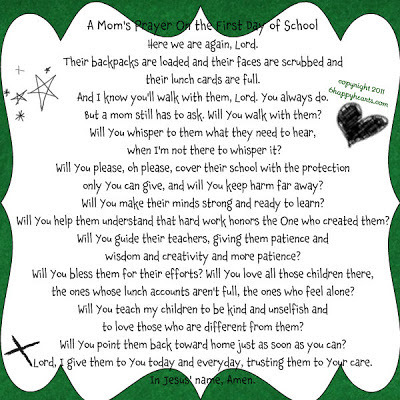 Good luck to all the mamas sending kiddos back to school next week! I'll be thinking about and praying for you! We can do this! Thanks for stopping by and I hope you have an extraordinary weekend! These are excellent!! I really like the specific one with matching Scriptures. That one was one of my favorites too! Ahh...such perfect timing! I can't believe i'm having such an issue accepting I have a high schooler. Crazy, huh?! I'm not so much sad as I'm in a constant state of amazement - seriously, how did these cute little toddlers suddenly get in high school?! 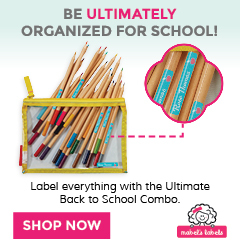 We forget sometimes that we also need preparation for back to school -- not just the kids! Thanks for this invitation to take grace! I know how you feel. I don't like when school starts back up either. I enjoy the quality time with my kids during the summer. Those prayers are great, especially the last one. It's so great when a mom understands! It's definitely a polarizing statement! Moms either dread the first day or can't wait! I like the lazy days, all the memories made, and just being together. Things take on a new crazy once school starts. 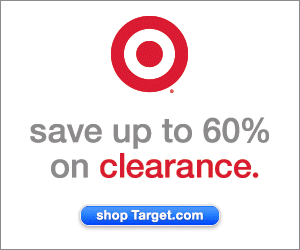 I hope you guys are transitioning well! Thanks so much for stopping by! Holly, these are beautiful and a great reminder that prayers is a powerful thing...I've chosen your post as my pick for this week's Friday Favorites Feature. The post will go live Thursday evening on several blogs. Have a wonderful day! Thank you so much, Dawn! What an honor! Definitely agree that prayer is such a powerful thing! Perfect Holly! 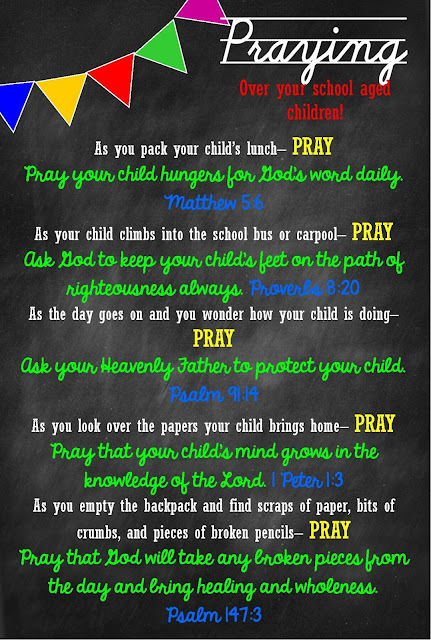 So many opportunities to pray for our children! So very true! We could truly spend every waking moment on our knees! I love these and will be printing them! Thank you so much for putting this together! Thank you so much for putting these together! OH MAMA!! Sending you all the love!! I know how you feel, I feel the same way too. My babies started school yesterday, I was clasping on to the last days of summer with a firm grip, but it's over. I miss my babes. FOUR YEARS. And now I'm crying. I have four years with my oldest too, and I cannot believe how fast it all went. I feel like she was just wearing fluffy dresses and pigtails skipping into Kindergarten. Okay, I'm in hot mess crybaby mode now, gotta go. Isn't it crazy how quickly it all goes? When we are in the middle of it - it seems like it will last forever but then it truly goes by in the blink of an eye! We've made it through the first six weeks - definitely filled with lots of prayers! Hope you guys are doing well too! Thank you! I'm finding that even with six weeks under our belts, these prayers are just as relevant!